Explore some of the most popular towns in Morocco on this private, 4-night adventure from Marrakech. Travel across the Tizi n'Tichka mountain pass 2,260 meters (7,410 feet) above sea level. See Berber villages and ever-changing landscapes en route to Ait Ben Haddou, a UNESCO world heritage site. 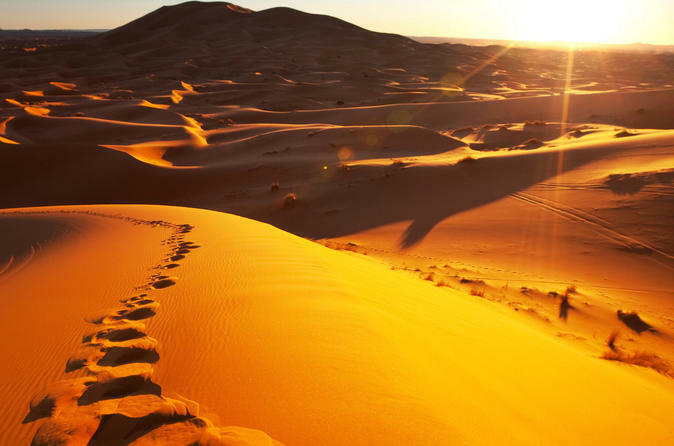 Also, visit the small village of Merzouga for a camel ride in the desert, and Fez, the cultural and the spiritual capital of Morocco. Breakfast and dinner each day, plus four nights of accommodations, are provided. Marrakech hotel pickup and drop-off included.